Jérémie Illouz completed his studies as an oenologist before cultivating 5.5 Hectares (14 Acres) of his own vines surrounding the hills of Cahors, which is the stronghold of the Malbec grape in France (no, Malbec is not from Argentina!). He only uses natural products in protecting his vines from predators, and his soil is worked carefully to not disturb the flora and fauna of his vineyard ecosystem. The harvest is always done by hand and only indigenous yeasts are used in the winemaking process. In addition to using Malbec, Jérémie also grows some lesser known grapes that in the past were traditionally used in greater quantities near Cahors, including Jurançon Noir and Valdigué. 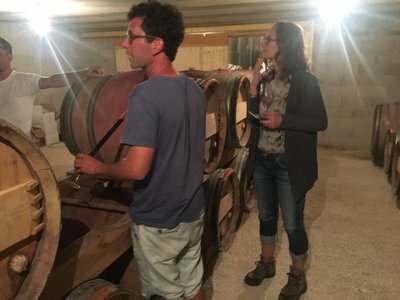 It is only a matter of time before this young winemaker's wines become better known, and they are quite difficult to find, even in Paris ! We feel very fortunate to be able to provide some of Jérémie's wine for you!